DETAILS: Peaceful and serene Miramar Beach home—ready for your next vacation! This stunning property is a quick two-minute walk to the beach and features beautiful lake views. With 5 bedrooms, 5½ bathrooms, and a variety of sleeping accommodations for 22 guests, this home is a perfect spot for a multi-generational or large-group vacation! The first floor, with its open floorplan, provides an ideal space for guests to enjoy time in the living, dining, and kitchen areas. Shades of blue throughout the décor create a tranquil and refreshing feel to this main living space. Three comfortable sofas and a large, mounted flat-screen television provide a large space to relax. The nearby dining area offers a large dining table and bench seating, with seats for an additional four guests at the breakfast bar. The kitchen features stainless steel appliances, granite countertops, and ample cabinet space. The first-floor master bedroom boasts a beautiful king bed, a mounted flat-screen television and a beautiful private bathroom with a glass-front shower, a separate spa tub, a separate toilet room, and a large vanity with double sinks. On the second floor, a bunk area offers a full-over-full bunk bed, a comfortable queen sleeper sofa, and a mounted flat-screen television—a perfect area for the youngsters in your group! Two additional guestrooms feature luxurious king beds, mounted flat-screen televisions, and private bathrooms with glass-front showers. The third guestroom on this floor offers two full-over-full bunk beds, a mounted flat-screen television, and a private bathroom with a glass-front shower and single vanity. The home’s fourth bedroom is second-floor master bedroom, which boasts a beautiful king bed and a private bathroom with a spa tub, separate toilet room, and a glass-front shower. Guests in this room will also enjoy the mounted flat-screen television and the peaceful lake views from the room’s private balcony. The pool deck offers a peaceful place to relax, perfect for basking in the warm sunshine on one of the six chaise lounge chairs. From the pool deck there are lovely views of the lake and also friendly turtles who love to swim up and say hello. Cool off with a dip in the private pool, which can be heated seasonally, and enjoy a delicious dinner from the propane grill. Miramar Beach’s sugar white sand and sparkling emerald waters are just a short two-minute walk from this property. Contact 360 Blue today! Parties, weddings or events held at the property must be pre-approved in writing by 360 Blue. Otherwise, guests will be subject to HOA fines. Our family of 11 stayed in the H20 house for a week. The house was just a short walk to the beach where we loved the complimentary 4 chairs and 2 beach umbrellas. The house was clean and kitchen was fully equipped. The private beach for the Shipwreck houses was great. Having those complimentary beach chair set ups is such a great bonus with this beautiful home! We are so happy you enjoyed it. Thank you for staying with 360 Blue and be sure to think of us for your next vacation! Our stay at the home was great. The house was spacious and had everything we needed to enjoy our stay. The access to the beach was easy and only a few steps away. We will definitely return to this location for future trios to Destin. 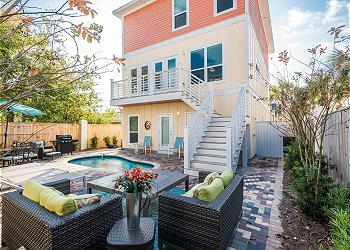 We are so thrilled that you all enjoyed your stay with us in Miramar Beach at this amazing home! We agree that the location of this home is perfect, making your stay stress-free and incredibly enjoyable. Thank you for staying with 360 Blue, we hope to see you again soon! We have a family of 10 and we had more than enough space for all to enjoy and have a little “alone” time occasionally. The kitchen is awesome and very well stocked. We cooked most evening meals and found every utensil and cookware needs for all of our meals. This is our third year to be in Shipwatch and H2O fits our needs the best of the three homes we have rented. The location is excellent and the beach is outstanding. We were very happy with the amenities and services provided by 360 Blue. First class management company and we hope to rent through them in the future. We are so pleased to hear how much you and your family enjoyed your stay! We agree that this home really does have it all and easily accommodates large groups! We would love to host you again and hopefully soon! We thoroughly enjoyed our stay at H2O! 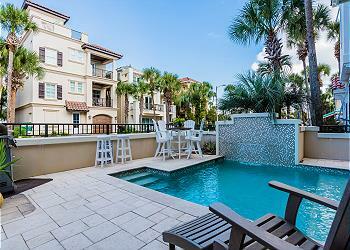 Absolutely PERFECT location with a very short walk to the beach and the outlets. We had 20 people in our party and we fit very comfortably. We hope to return again soon! Only things we would have changed: 1. The no canopy rule on the beach. This was not a rule when we booked last year (and might have been a deal breaker had we known), but they are currently trying to enforce it. 2. We were told check-in would be at 4 pm, but the cleaners were still there and we were not able to check- in right away and had to wait outside. We are so pleased to hear that you enjoyed your stay! We agree this home is in the perfect location and is a great option for larger groups. We apologize about not being able to set up tents on the beach, that is a new Walton County ordinance. We also greatly apologize for the cleaners not having the home done by the time of check-in. That is not to the standards that we at 360 Blue like to uphold. We appreciate your patience with us on that issue and we hope to be able to host you and your family again soon!